The name Lunastone may not sound so familiar, but the company have an excellent provenance. Based in Denmark, the company build high-quality pedals and have recently been joined by former TC Group VP of Marketing, Allan Strand, who takes on the role of CEO. The design work is overseen by guitarist and engineer Steen Grøntved, who founded the company four years ago. He tells us that he’s done extensive research into the various mechanisms of overdrive and has come to the conclusion that soft diode clipping, as used in the majority of overdrive pedals, can’t produce the amp-like overdrive he favours. The Wise Guy overdrive, one of a range of three related but differently voiced pedals (the others are called the Big Fella and the Three Stage Rocket), is actually two pedals in one — a clean boost and an overdrive — and each has its own true-bypass footswitch and status LED (red for overdrive and blue for boost). The cast pedal is a little wider than some of its contemporaries (119 x 93.5 x 34mm), but as the (metal Neutrik) jacks are on the top edge of the case rather than the sides, it takes up no more room on a typical pedalboard. Power can either come from a 9V battery or a Boss-compatible PSU. Tonally, the voicing philosophy seems to follow that of the Tube Screamer, insomuch as the lows are rolled off and the mids are emphasised, but although the circuitry includes the JRC4558 dual op-amp upon which the Tube Screamer is based, it’s used in a rather different way. 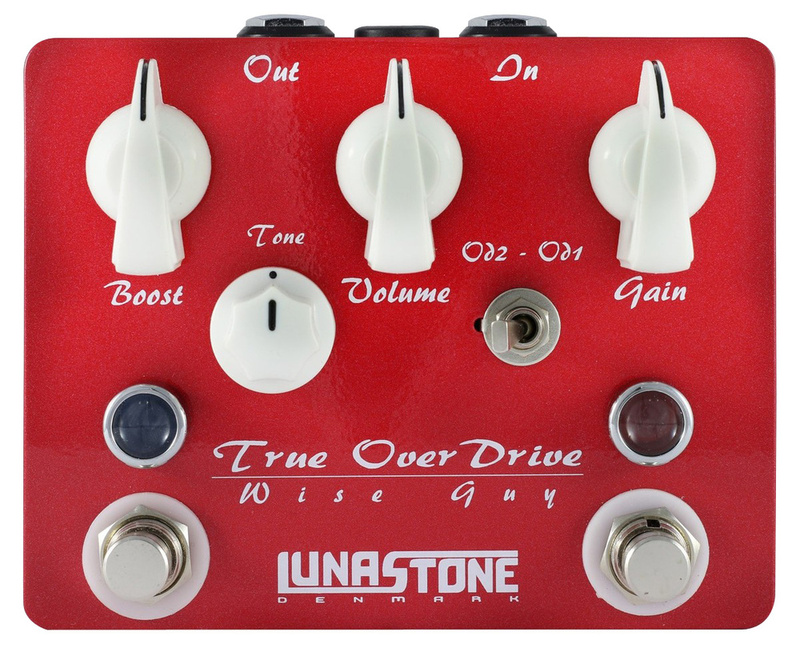 The overdrive is achieved not by using diodes but rather by cascading gain stages, which more closely emulates the way a guitar amp overdrives and combines the aforementioned mid focus with a nice high-end ring. Apparently the aim with this particular pedal was to go for a late ’60s to mid ’70s classic rock voicing. There’s nothing unusual about the control setup, with gain, volume and tone for the overdrive, and gain for the boost, which can add up to 15dB. Either section can be used on its own, or they can be used together. A further option is available in the from of a voicing switch — the OD1 setting offers a little less gain and has a fairly natural tonality, while OD2 emphasises the upper-mid bite of the guitar sound, and brings in a touch more gain. As expected, the tone control produces a darker sound when it’s positioned left of centre and a brighter one when it’s turned clockwise. I tested the pedal with two guitars, one fitted with a humbucking pickup and the other single coils, and my amp was set up to give a nominally clean sound. With the humbucker, I found that the best drive sounds come in the first half of the gain control’s travel, as going much further than halfway produces so much gain that you start to lose dynamics. That’s to be expected: there’s so much gain in hand because the pedal is designed to allow those with weaker single-coil pickups to access as much gain as they need. The two OD voicings are noticeably different. The more biting OD2 switch position gets you into the right territory for classic rock soloing and effortless pinched harmonics. With the gain turned right down, I found that I still needed to back off the guitar volume control slightly to get the sound to clean up when using humbuckers, but the single-coil pickups cleaned up pretty well at the lowest gain setting, even with the guitar turned up full. What you can expect from the boost section depends very much on how your amp’s input stage responds to being pushed, but it’s very useful just to give your sound a bit of a level lift for solos. It’s a nice feature, as right away you have three drive options (either or both sections) plus your amp’s natural sound. Having used this pedal for a while, this isn’t just a first impression: I like it a lot! It seems to live up to its design brief, and there is something different about the dynamic response that ‘feels’ comfortable to play; the sound is extremely responsive to playing dynamics, unless you pile on excessive gain while using hot pickups. In fact, it has a very amp-like feel, and there’s enough gain to cover all the classic rock ground regardless of your guitar’s pickups. Yet the circuitry itself is commendably quiet, making this a good choice of pedal to use in the studio as well as when playing live.